This recipe wasn’t the next one I had originally planned on sharing with all of you this week, but after such an overwhelming response to my posted picture on Instagram, I decided to bump this recipe up on my blog calendar. I hope you all find it as tasty as Preston and I did. As with many of the other recipes we’ve been trying out lately, I have to thank Wegman’s and their incredibly tasty Summer Menu magazine for the inspiration for this recipe. I promise Wegman’s won’t be the only source of inspiration for the recipes I share on here, as I have tons of recipes clipped from magazines as well as pinned on Pinterest. 1. Cook oriental noodles according to package directions. Set aside to cool. 2. Heat olive oil in wok. Cook garlic 1-2 minutes until lightly browned. Add green beans and mushrooms and cook until tender. 3. Add soy sauce, sesame oil, chili paste, and blue agave to wok. Season with salt and pepper. Combine all ingredients. 4. Add green onions, Fresno chili, and chicken until heated well. 5. Stir in oriental noodles. This recipe had a lot of kick, but was still light and fresh. If you’re looking to add more vegetables, onions, snow peas, and/or bamboo shoots would be a great compliment to the flavors already present in this dish. If you’re looking to cut carbs, either reduce the amount of oriental noodles that you cook, or eliminate them altogether. QOTD: What new recipe have you recently tried? 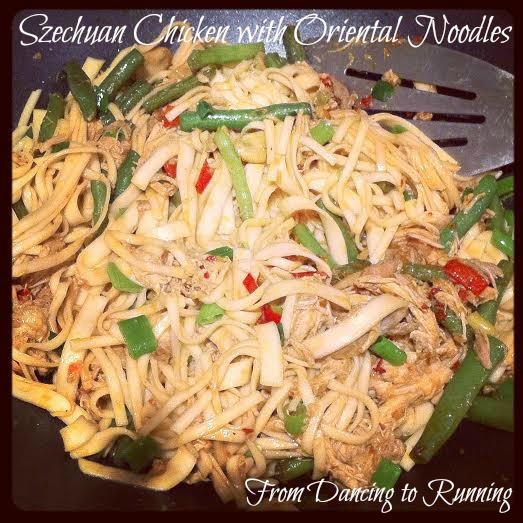 This entry was posted in Food and tagged chicken, cooking, healthy eating, recipe, vegetables. Bookmark the permalink. Yum! Looks tasty. Blue agave? Can u find that in any grocery store? We just made chicken and cheese enchiladas the other night that were delicious! I can’t speak to any grocery store, but I did find it at Wegman’s. Seems like something that maybe Trader Joe’s would carry as well. And enchiladas are delicious! I’ve only made them once for a dinner party. Seems like we’d be eating leftovers for days if I made a batch just for two of us. You should definitely try it! Your boys might enjoy it too if you reduce the heat by either reducing the number of chilies or cutting them out altogether. Ooh… sounds interesting. I’ve never heard of blue agave before. Does it just provide sweetness? I haven’t tried any new recipes lately to be honest. Things have been busy so I’ve been back to tried and true dinners so I don’t just give up and get take out instead! Blue agave is a sweetener. And good for you for not giving up and getting take out. Cooking old favorites is much healthier than the alternative. Wegman’s is the jam! This looks/sounds so good. Szechuan chicken is one of my favorite things. Wegman’s is by far my favorite store in our new area! Looks delicious Kathryn!! Can’t wait to try. Hope you enjoy it just as much as I did! Ooh that looks really good! After several vacations this summer, I’m trying to get back on track with eating right and cooking lots of my meals at home. I will definitely add this to my list. Plus I always like recipes that will inevitably have leftovers for lunches or dinners later in the week. Having leftovers is one of the reasons I love cooking stir fry meals. They always reheat so nicely.